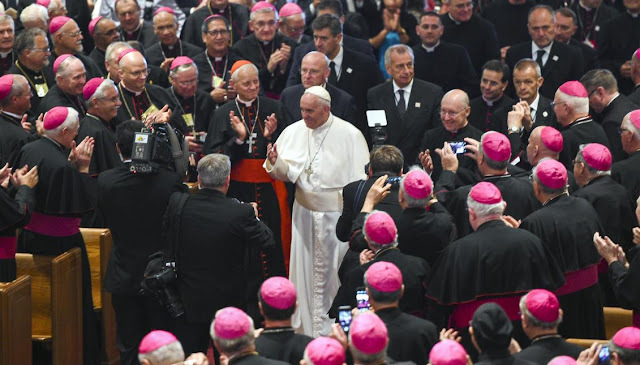 WASHINGTON—The United States Conference of Catholic Bishops (USCCB) will gather for the 2018 Fall General Assembly in Baltimore, November 12-14. During the assembly the bishops will discuss and vote on a series of concrete measures to respond to the abuse crisis, including those approved for the agenda at the September meeting of the Administrative Committee, such as a third-party reporting mechanism, standards of conduct for bishops, and protocols for bishops resigned or removed because of abuse. The bishops will also hear reports from the National Advisory Council and National Review Board. Media outlets interested in taking the meeting's satellite feed may request coordinates by email. Live stream and satellite feed is expected to run Monday, 12, 9:30 a.m.-6 p.m. Eastern, Tuesday, November 13, 9 a.m.-6 p.m. Eastern and Wednesday, November 14, 11a.m.-6p.m. The assembly will be live streamed on the Internet and will be available via satellite for broadcasters wishing to air it. The live stream will be available at: http://www.usccb.org/about/leadership/usccb-general-assembly/usccb-general-assembly-live-stream.cfm.